As this mattress industry news roundup shows, there continues to be more blurred lines between traditional mattress retailers and newer startup boxed brands. Unbox Mattress may earn a commission from purchases referred by this site. Thanks for your support. Just as Mattress Firm is poised to close 175 stores in 2018, Casper says they plan to open 200 stores (they already have a location in New York City and a napping store that charges $25 for some midday shut eye). Mattress Firm is the largest specialty mattress retailer in the US and has over 3,500 stores. Casper is also eyeing a possible IPO in 2019. Many Mattress Firm locations already sell the Purple mattress and other Purple products. Boxed brands open retail stores, retail brands come out with box beds and now a classic mattress brand is merging with a startup. Serta, the largest mattress manufacturer in the world, announced they will merge with online startup Tuft & Needle. In addition to Serta, they also manufacture Beautyrest and Tomorrow (a boxed brand) and supplies beds to Mattress Firm. While most put online market share at around 11% the segment is growing faster than traditional brands. In early August Helix announced a redesign of their mattress. Rather than letting a customer customize one mattress, Helix has come out with a whopping 9 options! To help you choose, take the sleep quiz to guide you to the right one for you. The beds also have a new look and have more foam between you and the springs than the original model. They still have the split option so 2 sleepers can get a mattress with different firmness levels on either side of the bed. Zinus brand is known for low cost boxed mattress options. Sticking with their value brand, a loveseat starts at only $274. It makes us wonder, in the future will more of the boxed brands sell furniture? Mattress Retailer Brooklyn Bedding is expanding their offline brands to include 6 new beds. One is called the Titan and it’s created especially for bigger/taller customers. This follows the supersize bed trend we’re seeing more often. You know sleep is trendy when Disney is selling it. The company announced a new “Sleep Shop,” which is basically pajamas and sleep related products all grouped together (not a new mattress store). They’re also collaborating with a certified pediatric sleep coach who gives sleep tips to parents. This month the company debuted a “Sleep Shop Hotline” which is a toll-free number with 5 pre-recorded messages from classic Disney characters. The hotline ended August 31st. In a super-competitive online bed environment, many brands are looking for ways to expand their market share. Yes, they need traffic. And who has traffic? Mattress review sites. Over the past year, starting with Sleepopolis being indirectly purchased by Casper, other boxed brands have followed. Brooklyn Bedding bought Honest Mattress Reviews, previously owned by Ryan Mohan who worked for Ghostbed. Leesa Sleep invested in the Mattress Advisor mattress review site. While they maintain they’re still objective it’s likely find high reviews for the site’s sponsor. Eight Sleep recently partnered with Dr. Brian Koo, director of the Yale Center for Restless Legs Syndrome (RLS) and member of Eight’s Scientific Advisory Board, to conduct an RLS study among participants who own the Eight smart mattress. Like Helix, Eight now offers a split firmness option. Have bedding industry news to share about new products or goings on? Make sure to send it to us for next month’s roundup: Contact Us. Read more sleep industry news here. Now for our monthly installment of mattress industry news. This roundup is for June, 2018. Soon it will be July and you’ll want to check out the 4th of July sales going on. A new month, a new sale! Unbox Mattress is a business and may earn a commission from purchases referred by this site. Thanks for your support. Eight mattress announced they’ve gone higher tech with AI. The company is using data collected from over 2.5 million nights of sleep to give you context about your sleep habits. The sleep tracker is a free app that connects with your mattress to help you improve your sleep. We think everyone will have one but Nectar is the latest to add an adjustable base to their product line. No longer seen as something only those in pain or older want – adjustable beds are for younger, hipper customers too who see them as a lifestyle product. Read more about the Nectar adjustable base. Newton Baby mattress and Eight Sleep announced new mattress protectors this month. Newton’s is notable in that it’s breathable, just like the mattress itself. Eight’s mattress protector is popular judging from the fact that it sold out immediately. Casper was sued by rival Serta Simmons Bedding LLC who claimed that the Casper Wave mattress infringed on three of their patents. The suit was dismissed. A trademark dispute between Mattress Firm and Tempur Sealy International (the rivals are former business partners) has been settled. Tempur Sealy sued Mattress Firm, “arguing the retailer violated a transitional agreement by selling, marketing and advertising Tempur-Pedic and Sealy mattresses after it was forced to stop selling the brands in April 2017.” Mattress Firm said they’re just trying to sell their inventory. Verdict? “Mattress Firm cannot use Tempur Sealy’s intellectual property since it is no longer an authorized retailer of the manufacturer’s products. However, Mattress Firm can still refer to Tempur Sealy brands and products like any other competitor…”. According to Mike Magnuson, founder and CEO of GoodBed.com, market share for online mattress brands is up from last year. In 2017 online brands held 15% of the market and this year it’s up to 17%. Number of online brands are on the market? It seems like there’s always a new brand in town but the number sits at around 175. Top 5 bestselling online mattress brands in terms of sales? Casper, Purple, Saatva, Nectar and Tuft & Needle. Casper is the biggest with revenue of about $300 million and estimates that this year it will grow to $375 million. According to the article, Nectar’s revenues were about $80 million last year and he projects they’ll more than double this year to about $200 million . Saatva? Revenues of about $210 million to $240 million in 2018. Purple? About $195 million with estimates for $350 million this year. Tuft & Needle? $125 million now with a projected $150 million. As we’ve seen – he predicts more online brands will move into physical retail locations, add products and raise prices (probably with higher end mattresses and adjustable bases). Is your mattress smart? Does it help motivate you and give you information to help you sleep? Eight mattress is the leader is smart mattresses. Note: Unbox Mattress may receive a small commission for any purchases you make after following one of our links. Today Eight announced a unique feature to go with the Eight smart mattress – an A1 powered sleep coach! The Eight Sleep Coach will use a vast database of information collected to offer personalized sleep coaching. The Sleep Coach uses AI to identify what is wrong with your sleep and gives information so you can improve. This is in addition to what Eight already does: track your sleep, warm your bed and it also has a smart alarm. It works with smart home devices such as Amazon Alexa, Hue smart lights, and Nest. Eight has always been focused on sleep and say that this is a way to help fight sleep deprivation. “Sleep deprivation is costing the US economy 400 billion dollars each year. The AI-powered Sleep Coach is our answer to this,” said Matteo Franceschetti, CEO and Co-Founder, Eight. How much sleep you got the night before and how it compares to your average for the month. How much you’ve tossed and turned and how that compares to people your age. How long it took you to fall asleep and what’s average for your age/gender. How fast you got out of bed after waking and how it compares to people who live near you. What days you sleep best. Percent of REM sleep and what’s considered most healthy. Eight’s mission is to help people understand how their health is affected by how they sleep, and how improvements in their sleep can ultimately improve the way they live. With over 200 billion data points collected to date, the company is working to create the largest sleep database in the world. Last year Eight collected and processed 500 terabytes of data from over 20,000 people. They executed over 200,000 sleep-related smart home actions, and warmed up beds for over 1 million hours. The Eight app is free to download, and must be used with an Eight Smart Mattress which starts at $699. The Sleep Coach is free for customers. This is the week of new mattress protectors! Both Eight mattress and Newton baby mattress came out with new mattress protectors. We always recommend that you use a mattress protector with your bed. Don’t sleep on your mattress until you do. Spills, stains, tears and other damage is inevitable, affecting things like allergies, resell value (should you decide to resell your mattress) and longevity of your mattress. Your mattress starts wearing down as soon as skin cells or sweat reaches the inside. After that bacteria starts to break down the foam or material. Newton has no foam and is the least likely to break down (plus it’s entirely washable), but a waterproof cover means less laundry for parents. Note: Unbox Mattress has affiliate relationships and may earn a small commission on any sales and allows us to continue to publish bedding industry news and reviews. After a successfully funded Kickstarter campaign which raised $27,11 this April, the company that introduced the unique, breathable Newton crib mattress debuted a new crib mattress pad. Like the mattress, the mattress pad is also breathable. Size: 28” x 52” and 3/8″ thickness. Made from 100% polyester for easy cleaning with a soft waterproof TPU liner, or thermoplastic polyurethane layer, a waterproof layer that uses a heat bonded lamination process to a plush fabric material that is used most often in cloth diapering. Non toxic. The crib mattress cover goes right over the quilted mattress cover. The sides are stretchy. Lifetime manufacturer’s warranty. That means if it’s damaged in the course of ordinary use, they will provide a new one at no cost to you. The company’s aim is to provide safer, healthier sleep for babies. Eight also introduced a new mattress protector made to go under the Smart Cover to make your mattress last longer. It’s already a hit and has almost sold out in its first few days. This is Eight’s first ever mattress protector. 3-sided mattress protector that covers the top of the bed and the sides (not the bottom). Shields from liquids, bacteria, dust mites, pollen, and mold. Made with hypoallergenic Construction for cool sleep to make your bed last longer. Quiet – the material almost feels like a sturdy thick t-shirt. Price: $95.00 for a queen. Learn more here. Now for our monthly installment of bedding industry news. This roundup is for May, 2018, one of the top selling mattress months of the year (see our roundup of Memorial Day mattress deals). If you didn’t know Derek Hale of Sleepopolis sold his website to Casper (indirectly) and has now turned to reviewing another product for the home: vacuums. His site, Modern Castle, has both a website and YouTube channel. Speaking of Casper, we had a chuckle when basketball superstar Dwight Howard of the NBA team the Charlotte Hornets was dubbed the Human Casper Mattress by a writer at the Urban Daddy website. Were not really sure what that means but you can check it out here. Please comment below if you have a guess! Mattress, Pillows, and Bases, oh my! Nolah just introduced a new mattress, pillows and adjustable bases. Their existing Nolah Mattress is now called the Nolah Original 10″ mattress and the new 12″ is the Nolah Signature 12″ mattress. The two new pillows are the Nolah AirFoam™ pillow and the Nolah AirFiber™ pillow. MyPillow donated over 70,000 MyPillows to attendees at a large Minneapolis Christian evangelism event so they could all clobber each other with a pillow. Great way to get out your frustrations but it would probably be better if they invited liberals to the fight! Purple is expanding its offline presence by selling mattresses in 30 Chicago-area Mattress Firm stores. They plan to open at Mattress Firm locations in Phoenix and the Bay Area next. They also lost their CEO, are searching for a new one, and announced their fourth quarter earnings report. Helix‘s new sheets are made of a rich soft cotton-polyester blend with a two-sided sateen weave for comfort with breathability. They feature a high 600 thread count for that luxury feeling and wrinkle resistant material for convenience. The sheets are available in White and Slate (grey). 3 year warranty. A set of queen sheets retails for $125. The trend is for boxed mattresses and offline mattress showrooms or stores to blend together. More boxed companies have locations and more traditional brands have boxed mattresses. Nest Bedding has several retail locations that now includes Studio City, California (aka, Los Angeles). Isn’t this showroom pretty? It certainly doesn’t look like the typical mattress store! Leesa Sleep announced that they’ve sold more than 300,000 mattresses since its launch just three years ago. They’ve also donated 26,000 mattresses donated to-date. Read the press release here. We all love to find the best deal and save money. Memorial Day is Monday, May 28, 2018 and it’s the perfect time to buy a mattress online. Memorial day is like Black Friday in the mattress market – it’s the best time for mattress deals. We compiled a list of Memorial Day sale on mattresses to help you find the best offers depending on what brand or type of mattress you’re looking for. Most start a week or more before Memorial Day so you don’t have to wait – you can shop the deals right now. Some even last a few days after Memorial Day. Don’t have the money up front? Pay monthly instead so you still get the savings but aren’t blowing the budget. Most online mattress stores offer financing through Affirm. Read more about Affirm financing and see a list of mattress brands that accept Affirm by clicking the link above. Here’s a roundup of mattress deals for Memorial Day. Note: this list will be updated as we learn of new Memorial day sales and each year. Also check out Mattress firm Memorial Day sales. On Memorial Day we remember those who died serving our country by enjoying the freedom they fought hard for. It’s also a great day to get better sleep by saving cash on a new mattress. Who knows how the two got associated but my guess is it’s because people have a 3-day weekend so can spend the time to buy things like cars and mattresses. Online mattresses are already so reasonably priced (no retail store or cost of sales people). These sales makes the prices even lower. Scroll down for details or to the end where we have a table so you can quickly compare mattresses, prices and discounts to find the one that’s best for you. Note: the links below are affiliate links and we earn a small commission on any sale, no cost to you. save $200 on any size Mattress with Coupon Code MEMORIAL good 5/19/18 – 6/01/18 – shop Agilitybed.com now! 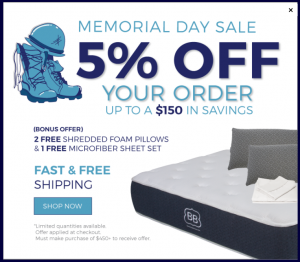 Memorial Day Sale – Save up to $150 on an Amore Beds mattress and Receive up to 2 FREE Pillows ($120 value), PLUS 50% Off Copper Ion Fabric Upgrade! All natural, non toxic green mattress (green like an avocado!). Save $150 on every mattress with code HONOR2018. Or get 2 pillows free with any mattress purchase through May 31st using the code 2FREEPILLOWS (just be sure to have 2 pillows in your cart). Memorial Day deal: 20% off if you spend over $800 or 10% off $799 or less. This is a great option because you can apply it to any mattress they carry. Dubbed the mattress for athletes, Bear is an all foam mattress (they recently came out with a hybrid model too). A queen is $840 retail. Take $200 off your purchase of $1200 or more. Take $100 off your purchase of $700 or more. Sale runs through May 29, 2018. The original company that trademarked the term “bed in a box” has a sale going on too. See our Bed in a Box review here. Receive 5% off plus two free Plush Pillows when you purchase a Serenity, Tranquillium, Silk Symphony or Adagio mattress until May 31. One pillow for Twin & Twin-XL Use coupon code MEMORIAL5 at checkout. Offer applies to sizes full, queen, king, cal king or split sizes. While supplies last. Does not apply to previous orders. Named one of Time Magazine’s best inventions. Read our Casper mattress review here. Take 10% off your order with the purchase of a mattress. Use code SUMMER10 and this link. DreamCloud is the most gorgeous luxury hybrid mattress in a European style with tufted clouds. Read our full DreamCloud review here. High tech mattress, Eight mattress tracks your sleep, heats each side of the bed at a different temperature, wakes you up at the moment of lightest sleep every morning, and lets you connect your mattress to the other smart home devices in your house. Yes, you can control your mattress through your smart phone (iOS and Android). A blend of foam and memory foam. 50% OFF Foam Futon Mattresses and memory foam mattresses. Huge selection and sale of mattresses, pillows, latex beds, wool beds, mattress toppers and more. Check site for all the Memorial day deals. Organic bed-in-a-box, handcrafted in the U.S.A. using domestically-sourced materials as much as possible. Happsy focuses on certified-organic, non-GMO materials for minimal environmental impact. They claim to pay employees a fair wage and they give back a portion of our profits (1% For The Planet). Memorial Day Deal: Happy Memorial Day! Get FREE sheets and pillows with any mattress purchase. Valid 5/25 4 PM – 5/29 9 AM. High end 2-sided mattresses that are Double-Sided for longer lasting longevity. Our products are all high quality and build to last in the USA. 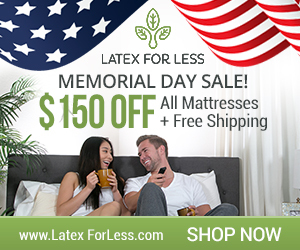 Click the banner to go to Latex for Less Memorial Day Sale: $150 off a mattress! Layla is a memory foam mattress that has the benefits of copper for cooling and health. For those who love memory foam but tend to get too warm at night. It’s firmer on one side and softer on the other. In celebration of Memorial Day, Layla is holding their BIGGEST sale yet — $100 OFF any size Layla mattress + a FREE LAYLA PILLOW! The pillow is amazing! 4th month trial. Lifetime warranty. Free shipping and returns. Made in USA. 🇺🇸 $200 off Molecule Mattress 🇺🇸 Medium firm. All layers are 100% polyurethane, made in the USA and CertiPUR-US® certified (manufactured without chemicals or heavy metals, and are phthalate-free and low-VOC). Medium firm. 12.25-inch thick. Nolah just introduced a new mattress, pillows and adjustable bases. To celebrate they’re having the biggest sale of their history. 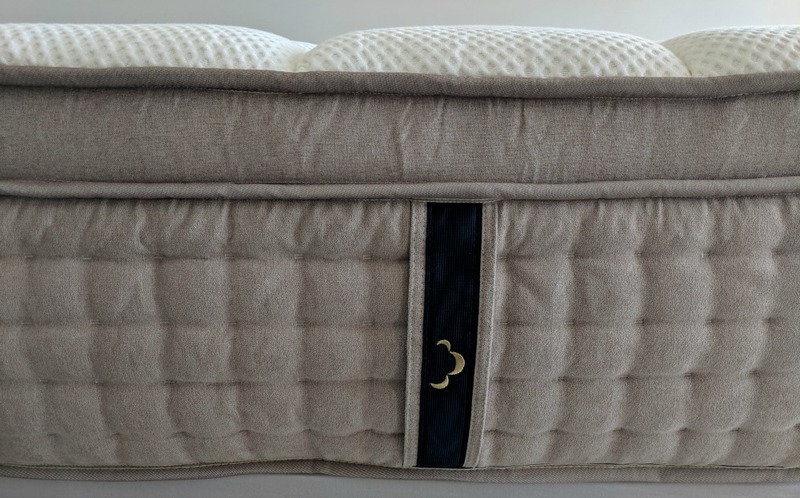 The new 12″ Nolah mattress, two NEW Nolah pillows, and two NEW premium adjustable bases! Their existing Nolah Mattress is now the Nolah Original 10″ mattress and the new 12″ is the Nolah Signature 12″ mattress. The two new pillows are the Nolah AirFoam™ pillow and the Nolah AirFiber™ pillow. Choose from either a cash discount and 2x FREE pillows with purchase of the original mattress OR cash discount with 2x FREE pillows for the new 12″ Signature mattress. Muse mattresses comes in soft, medium and firm. 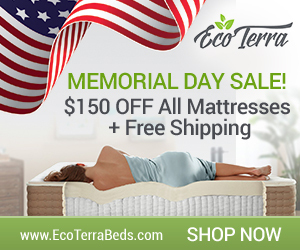 Take $125 off any mattress with code “MEMORIALDAY” until July 31st. Purple mattress doesn’t discount but they add freebies with purchase. This year is their biggest sale ever – FREE Purple seat cushion and FREE Purple brand sheets when you buy a mattress. Good on the original Purple and the new Purple mattresses. No code needed, automatically applied at checkout. Freebies worth almost $200. There’s the original Purple and the new Purple mattress, compare the two. Want to learn more about Purple? Read our new Purple mattress review. Wide variety of bed options from the best available 100% organic natural latex mattress all the way through to the most comfortable sofa mattress on the market, and everything in between. They are unique in that they offer sofa bed mattress, RV mattresses, adjustable beds, toppers, and more. Plushbeds offers a 100 night trial and 25 year warranty. Methylene Chloride …and 10,000 other harmful chemicals! PlushBeds has great customer service and is available 7 days a week by phone, email or chat. Rated A+ with the Better Business Bureau. Leesa is a foam and memory foam mattress that is Made in the USA. Ships free. 100 night trial. Luxury memory foam mattress with a 365 night risk free trial, free shipping and returns and forever warranty. Read Nectar mattress review here. Nest Bedding is one of the few Direct To Consumer mattress companies that has their own factory in the USA. Their mattresses are made with luxury organic and cruelty free materials and many of our products are Vegan. They offer a wide range of products vs a fix all product. Use code REMEMBER100 to get $100 off and a set of free sheets! 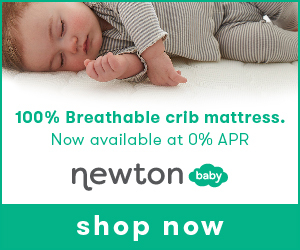 Newton Baby mattress is the most unique breathable baby mattress ever invented. Take 20% off site wide for their Memorial Day sale. Get the 20% discount with our link below and code MemorialDay2018 until 11:59 EST, May 29th. Check out this Newton Baby mattress review on YouTube. In honor of the holiday, we’re offering a 20% discount at NewtonBaby.com with code MemorialDay2018. It will run until 11:59 EST on May 29th. There’s even more savings, too! Enjoy free shipping (no promo code needed) and free returns along with Newton Baby’s 100-day money-back guarantee. Nuvanna is a highly rated made in the USA all foam mattress. Memorial Day Mattress Sale! Nuvanna Mattress blowout get 5% OFF until June 30th 2018 use coupon code NUVMEMO5. Or save 10% OFF Coupon code NUVMAT10 until July 31st. Copper-Infused 100% Pure Talalay Latex mattress. Save $200 on a Puffy Mattress for Memorial Day. Comes in two models a 10″ medium firm and a 12″ medium. 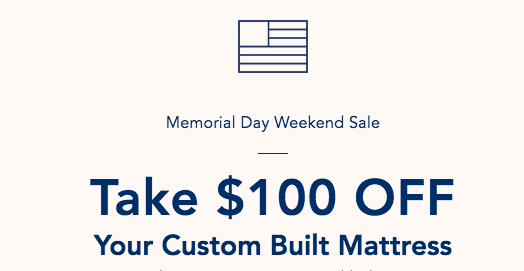 Helix is offering $100 off all mattresses with code MEMORIALHELIX in honor of Memorial Day all weekend long! Helix rarely provides this deep of a discount so don’t wait. Like most online mattress brands, shipping is always free and Helix has a 100-night sleep trial. Saavta does not offer discounts, promotions or sales. However, they do offer a $50 military reduction per sale for all those who have served and are serving patriotically for America. Mattress Type: Saavta has traditional type spring mattresses with a euro pillow top but sold online. Some memory foam in the lower back area. Special bonus: Delivery with in home set up and mattress removal. Ratings: Over 15,000 5-star reviews. 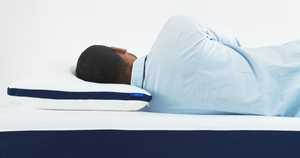 The SpineAlign Pillow has a utility patent based on its uniqueness and is the first pillow specifically designed to help keep you in correct sleeping posture on both your back and side while at the same time being fully adjustable & customizable to fit your specific head and neck. Posture is a largely ignored topic when it comes to choosing a pillow, but if you’re not sleeping in correct posture then you’re most likely putting unwanted and potentially harmful stress on your head, neck and spine which can lead to several different symptoms like headaches or migraines, numbness & tingling in arms and hands, back & neck pain and the list goes on and on. Designed with a smaller side and a larger side so it will fit most people. The average person owns 7 pillows because they can’t find one that works. The SpineAlign Pillow was invented by a sports chiropractor, Dr. Jason Loth, DC, CCSP, CSCS, CMTA who has over 17 years of experience dealing with the biomechanics of the spine. The goal of SpineAlign.com is to help the tens of millions of people who suffer with insomnia (National Sleep Foundation says 50-70 million people have insomnia), due to being in pain or just uncomfortable because their pillow doesn’t support their head & neck get a great night sleep and hopefully have improved health. When it comes to making durable foams two things come in play: the density of the foam, and the process the foam goes through. Memory foam beds with 2 lb density are considered okay and are sold cheap everywhere. 3 lb density beds are considered good and are pricier and found in branded mattresses. Sweet Zzz uses O-CellTM Foam which is 5 lb and 4 lb only (nothing lower). Beds are made to order – they take 3 days to make your bed after you order and have a top in the industry lifetime warranty on their beds. Although it’s tough to tell what is a Memorial Day sale, Amazon puts their mattresses on sale this time of year. However, check the bestseller list for deals from Lucid and other top memory foam mattress brands on Amazon. See also: Mattress Firm Memorial Day sales – in stores and online. Every month thousands of us type these words into Google: “how to fall asleep.” We deal with sleep issues like sleep deprivation, sleep apnea, insomnia and more. That or we’re just looking for better or deeper sleep. We should get at least 7 hours of sleep as adults and 1 in 3 Americans aren’t getting enough of it. March is a big month for sleep. It’s National Sleep Month and we need it, thanks to Daylight Savings time. Nothing like the clocks springing forward an hour to throw off our sleep schedule! It’s also the month we have National Napping Day (the 12th). The foundation of good sleep is a good mattress and pillow. Research from the National Sleep council found that a new bed was associated with an increase of 42 minutes of sleep. Both your bed and pillow are so individual. That’s why we like the boxed versions (obviously) because they give you several months trial period so you can try them out at home. One issue: we can’t turn off our minds at night. What helps? Mindfulness, meditation and relaxation techniques. This track is 3 hours of relaxing music to help you sleep and has over 62 million views. YouTube has self-hypnosis for sleep and a vast collection of sleep tracks. If you don’t think smell affects you, remember what it feels like to walk into a place that smells terrible. Your body tenses up and you want to leave! The opposite happens with pleasant scents – you relax. You feel peace and calm. Essential oil can have a big effect on sleep. With over 1,500 glowing reviews on Amazon, this comforting spray dubbed the “pillow potion” helps you fall asleep faster. This is ultra soothing, helping calm and relax you before bed. 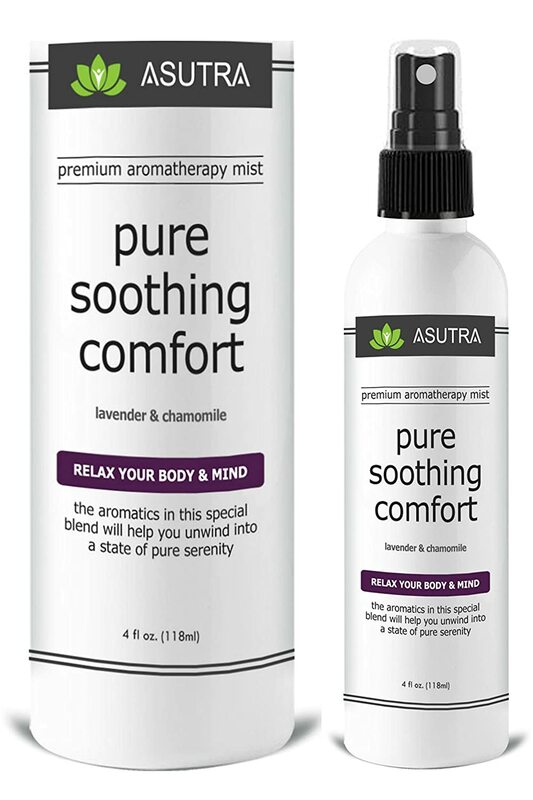 Simply spritz this aromatherapy mist in your room, on your pillow or your sheets. Reviewers rave about how well it works. Your sheets will smell so fresh and a small amount works for days. Contains all natural ingredients including lavender, chamomile, hazel, rosemary, aloe and jojoba oils. Also hypoallergenic, cruelty-free, and alcohol-free. If the idea of lavender essential oils sounds soothing, then you may want to check out the Lavender Bliss Pillow. 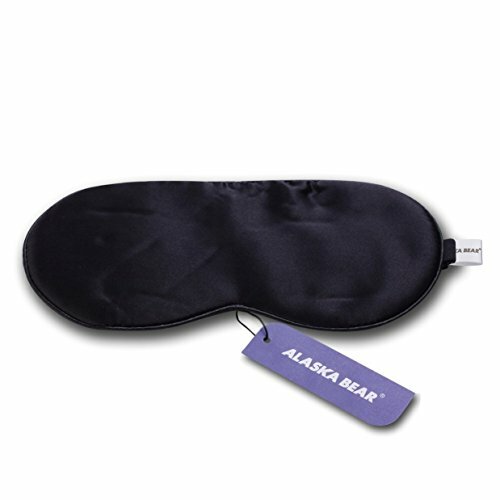 Sleep anywhere at any time with this bestselling hypoallergenic 100% silk eye mask. Completely blocks out light. Your body needs the hormone Melatonin for sleep and light prevents your body from making it. Light from your electronics, tv and even your alarm clock can hurt your sleep pattern. If your room isn’t completely dark, you’re traveling, or need to shade your eyes from the light of someone else’s screen, this is it. Minimal rubbing to not bother your eyes or lashes. Silk means it leaves no marks. 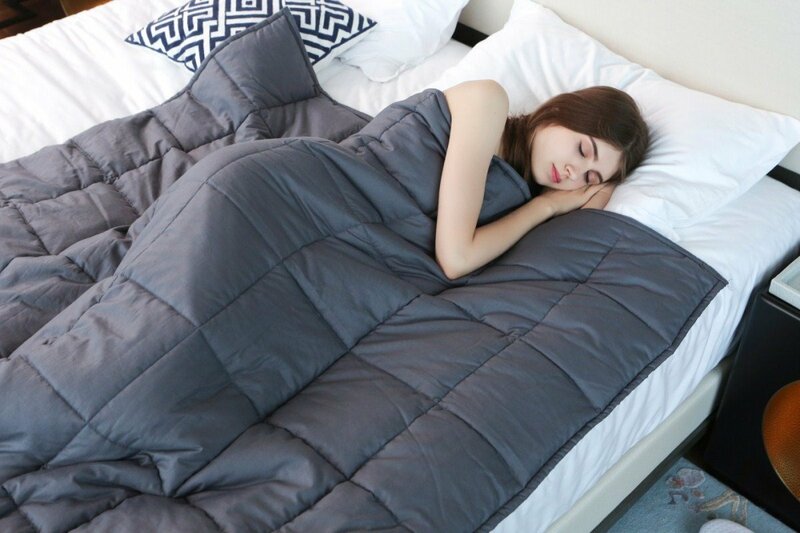 The Journal of Sleep Medicine & Disorders did a small study to see if a weighted blanket could improve sleep. Participants slept in their regular environment then with a weighted blanket every night for two consecutive weeks. Sleep quality was measured and found that the weight of the blanket reduced movement which made for more sound sleep. Polysomnography (PSG) data found a significant decrease in time spent awake during the night and a significant increase in total sleep duration. In case you’re worried about getting too warm, the fabric is made so it doesn’t provide extra weight. There are different weights to choose from so you get the one recommended for your body weight (it should be more than 10% of your body weight). Melatonin isn’t just affected by light, it’s also temperature sensitive. When you get overheated during sleep, your body doesn’t produce adequate melatonin and growth hormone. These are both important for repair and are anti-aging. 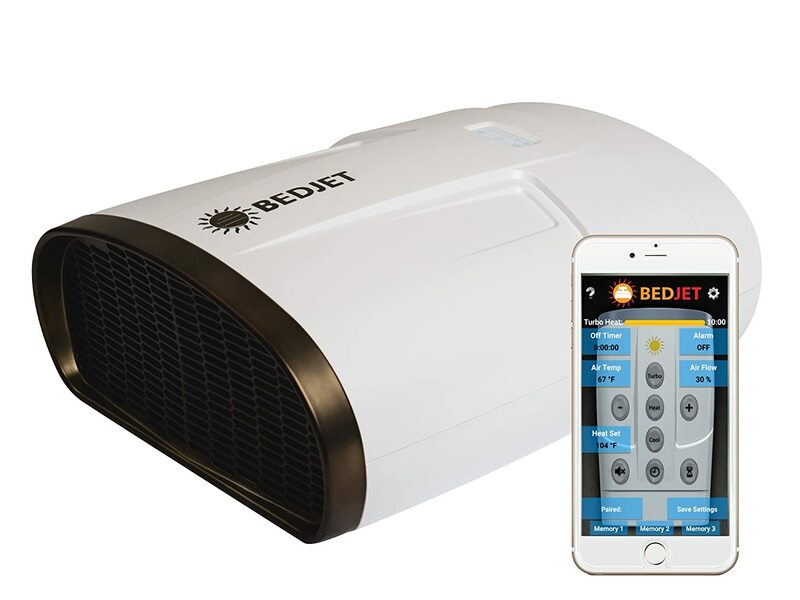 BedJet is a small bed fan that hooks into a special comforter. It helps regulate your bed’s temperature. If you’re in menopause or sleeping hot, this ‘as seen on Shark Tank’ product, is a lifesaver. It circulates cooler air near the floor into your sheets so you can sleep with sweating. It’s like having a room fan subtly blowing right next to your skin. Now it’s your turn unboxers. What’s helped you get quality sleep? We all know about adjustable beds – but what about adjustable pillows? Bed in a box mattress companies and even traditional mattress/furniture retailers are introducing adjustable pillows. Helix is the newest company to market an adjustable pillow. They offer both a regular and a cooling version made of memory foam and down alternative. The cooling version (Helix Cool) has a high-end ultra cool knit polyethylene fabric. This material has a higher heat transfer, which means it is a lot cooler than typical fabrics – that’s why it’s cold to the touch. The Helix pillow has 2 support layers which can be kept inside or removed to adjust the height and feel. What is an adjustable pillow? We’ve seen smart pillows and cooling pillows (hot on the market) but we noticed a lot of adjustable pillows at the Las Vegas market. Adjustable pillows are pillows that can be changed to fit your preference in a number of different configurations. The loft or height of the pillow. You can make a higher or flatter pillow by adding or taking out some of the material (such as shredded memory foam) inside. The pillows unzip and sometimes have a mattress protector as part of the system. The use of a pillow insert to change the feel and/or height of the mattress. Many of these pillows are within the $80-100 price range and come with a warranty. When it comes to boxed bedding products, the bonus here is that they usually come with a trial period, just like mattress. Pillows are even more personal than mattresses because you usually don’t share one with anyone. Your face is directly on your pillow. People can be very picky about the feel and other features of their pillow. For example Purple pillow has a 100 day trial which means you have 100 days to test it out and can return the pillow for a full refund if it doesn’t work for you. 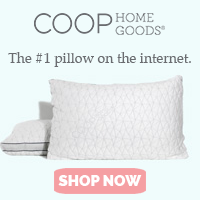 So does the Eden pillow from Coop Home Goods – get 15% off a pillow bundle. Their pillow sounds amazing with all of the adjustable pillow benefits plus you can literally throw it in the wash. The Eden pillow actually has a 5 year warranty! Brooklyn Bedding shredded memory foam pillow. This won’t get lumpy over time like some shredded memory foam pillows because it has a straight edge cut and fabric to keep the foam together. MyPillow has clumped up under use for us. Watch for our review and comparison of a typical bamboo pillow like MyPillow and Brooklyn Bedding. After many months and tests, this is one of our favorite pillows. It features a thick cover and unzips to add or remove foam. Look out for our Layla pillow review coming soon!